What Is the Difference Between Lizards & Geckos? A gecko is a lizard. Like a lizard, it has scaly skin, lungs, breathes air and lays eggs. There are about 800 species of gecko which are divided into Diplodactylinae, Gekkoninae, Sphaerodactylinae and Eublepharinae, with the Gekkoninae being the largest family with about 550 species. They are docile toward humans and make good pets. But there are some characteristics that make geckos a little different from the average lizard. The gecko is an often vividly colored animal with almost translucent skin made of beaded scales. They like to hang around houses or trees where they have access to insects. They are nocturnal, and the female lays one or two brittle shelled eggs per clutch. Geckos range from 4 to 10 inches long and live in the warmer parts of the world, especially dry and semi-dry deserts like those found in Afghanistan, the middle east, northwest India and the southwestern United States, though the tubercular and ground geckos can be found in Florida. The former probably came from North Africa, and the latter probably came from the West Indies. Like some other lizards like the glass snake, geckos can detach and then grow back their tails. A common lizard is cold-blooded, and can be found in the warmer parts of the world. Lizards have scales, eyelids, and their feet have claws that help them run up fence posts, walls or rocks. Unlike the gecko, many lizards like the anole, skink, and monitors are diurnal. They rely not on sound to communicate but body language and the detection and giving off of pheromones. In the anole’s case, they use the head bob and tail flicking. Male anoles display the dewlaps on their throats to court females and intimidate other males. Geckos are unlike other lizards in that they chirp at each other when they’re in groups. The gecko might also hiss or crackle or chirp if it doesn't want to be handled. The gecko’s hearing is quite good. Another strange feature about them is if one looks at a gecko’s ear from the side, light shines through its head. This is because of the way their auditory system is built. Geckos, unlike other lizards, don’t have eyelids. They have a membrane covering their eyes which they clean by licking. The eyes of a gecko have vertical slits. The common leopard gecko is unusual for a gecko in that it has movable eyelids. Though other lizards can climb up vertical surfaces, geckos can walk upside down on ceilings. They can do this because of the pads on their feet, which are larger than most lizard’s and adhesive. 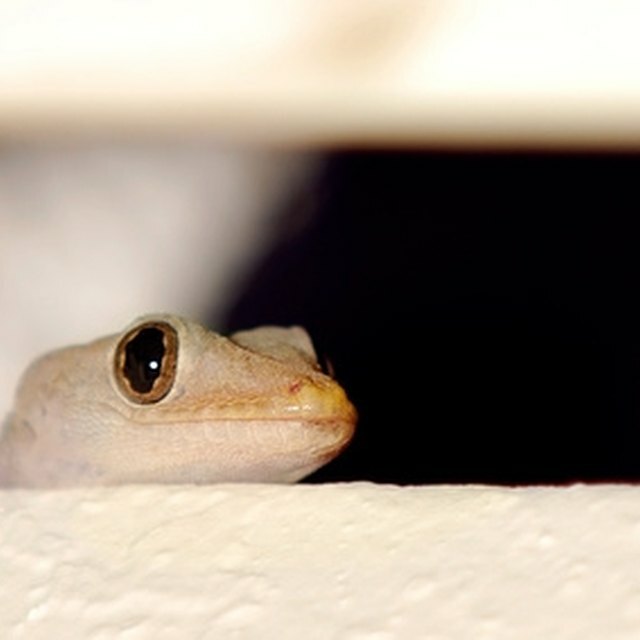 The ability to climb all over makes geckos welcome in many homes, as it's easier for them to capture insect pests. Again, the leopard gecko lacks these pads, but has clawed toes like most other lizards. McKanic, Arlene. "What Is the Difference Between Lizards & Geckos?" Sciencing, https://sciencing.com/difference-between-lizards-geckos-8340446.html. 13 March 2018.